He poured hot coffee into the mug he’d taken from the student union the first week he was in college. It was one of his few keepsakes. The day-old coffee was bitter. He searched through a cardboard box of cooking supplies looking for creamer and sugar. The glowing hands on his dive watch pointed to six thirty-seven. The other merry hipsters were asleep or passed out. With luck, Joe or Will would be up by eight. The girls would sleep until nine or later. He hated the time he spent waiting for others. Restless, he picked up a life vest and paddle, and walked to one of the overturned canoes. Someone at the university had painted SCSU and the number seven on the side of the boat. He loved being on the water. Yesterday Joe gave him his first sailing lesson. He had only recently learned how to canoe. As a kid, he spent his summers on Lake Erie. His family had a cottage and a rowboat. He enjoyed rowing and he had taken to canoeing almost immediately; however, he had never canoed alone. This morning he longed to be a part of the natural world, no classrooms or questioning students, just water lilies, beavers, and loons. He decided he would canoe to the small cove across the lake. Yesterday he’d seen a pair of loons by the entrance. He threw the life vest in the canoe, put on his topsiders, and stepped into the dark water. Even along the sandy shore, the water was cold. Joe said it dropped into the sixties at night. How Joe knew these things no one could say, he just did. He climbed into the canoe and placed the mug of coffee between his legs. The hot mug burned his thighs where his shorts ended. Grimacing, he moved the mug until it and he were safe. The life vest was too small to wear while paddling, so he tied it to the middle seat. Using the paddle, he pushed the aluminum boat off the sand and stroked out into the slate gray water. Smoke or fog lined the empty shoreline at the southern end of the lake. Looking back, he saw the three green tents zipped shut, clothes drying on a line, and six logs circling the fire pit; a wisp of smoke spiraled up from the smaller cooking fire. Last night they had talked and drunk until two in the morning. It was only for a lack of flashlights they hadn’t gone sailing. The lake was an hour north of Brainerd in northern Minnesota. His friends Charley and Mary owned the entire lake. They were faculty in his department. Each month, they lived on her income and purchased land with his paycheck. The land was in a trust that excluded development. Mary said they wanted their kids to have a wild place to camp and relax. Charley claimed the real owners were the flies and mosquitoes. Yesterday he and five of his hippie friends from college had invaded the peaceful lake, carrying backpacks, pots and pans, canoes, and a sailboat down the deer path from the road to the lake. After spraying for mosquitoes, they dug a latrine. Joe even fashioned a toilet seat on a board that he placed on two logs over the hole. Next to the makeshift outhouse, they left a coffee can with a roll of toilet paper and spray bottle of Off. Joe’s instructions were to spray your whole body leaving a mist of bug spray in the air. Then you dropped your shorts and stepped into the mist. Good advice, but insufficient to combat the cloud of horseflies, black flies, and bird-sized mosquitoes that followed the hipsters everywhere they went. According to Will, mosquitoes in Minnesota hated spicy food. For dinner, they consumed massive quantities of tacos and tequila. Looking at the bites on his arms, he wasn’t sure Will was correct, and judging by his headache, he wasn’t convinced the cure was preferable to the bites. The day was supposed to be hot and sunny. Instead, the sky was gray, the overcast clouds blending seamlessly into the cold dark lake. He dipped his bandana into the water, wet his lips, and splashed the icy wetness on his face and forehead. He tied the red bandana on his head like a pirate. Feeling better, he dug the paddle deep into the silver water. Across the lake, the water mirrored the shoreline reflecting the granite, birch, and ferns crowding the water’s edge. A breeze off the eastern shore pushed the little boat. The front of the canoe lifted as he stoked. Right stroke, left stroke, glide, rudder, right stroke; the mechanics of canoeing was all about smooth motion and balance. Using the paddle, he kept the bow pointed to the entrance to the cove. The mouth to the cove was narrow, perhaps fifty feet across. Inside, the horseshoe cove was smaller than he expected, less than three hundred feet at the widest part. The shoreline was a dense line of trees interspersed with large walls of granite. Unlike their patch of sandy beach, stretching out from the trees was a carpet of brown and red turf and then lily pads. 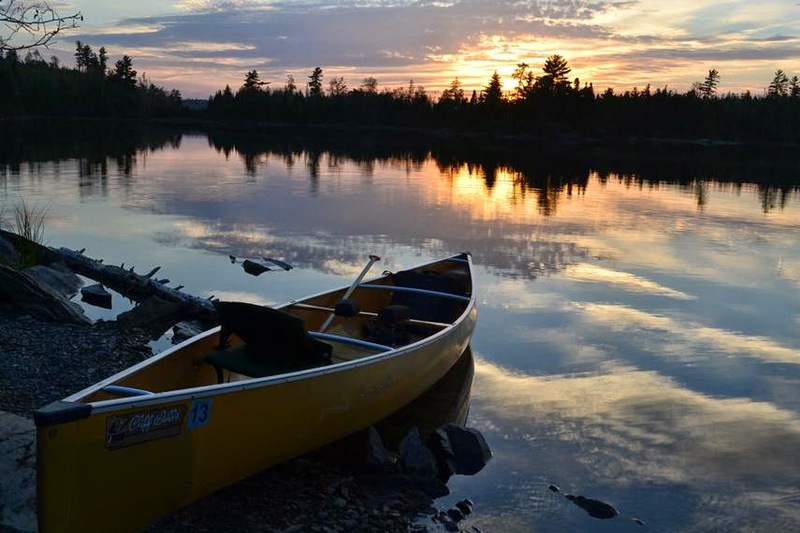 He let the canoe drift, as he admired the natural beauty. The dark water was perfectly still. Only the buzz of insects and sound of songbirds filled the air. A male loon called out his plaintive yodel. La…ooon, he called. Was the loon calling to his mate? He didn’t know, but the sad call set the tone for everything he was feeling. He and his friends were changing. He missed the life he once had, a life filled with small adventures. The loon called again. He wants breakfast, he thought. He realized it was late and he wanted breakfast too. He turned the boat and stoked for the opening to the cove. The wind had picked up and there were small waves entering the mouth. The front of the boat lifted as he neared the narrow entrance, pushed back by the wind and waves. Twice he tried to paddle out of the cove and each time the wind pushed the front of the boat back. He needed a person in the front for weight and power. Alone in the back of the canoe he was unable to paddle fast enough to overcome the wind and current entering the cove. He needed to shift his weight to the front and paddle from the bow of the boat, as the Indians did in movies. Technically, the position of the seats determined the bow and stern in a canoe. The seat in the front allowed space for your legs. He knew he could move to the front seat or he could turn around, kneel behind the rear seat, and paddle. Deciding it would be easier to take the paddle and cross to the front, he stood and stepped across the middle seat. The next thing he knew, he was flying out of the boat, the paddle going one way his coffee cup and hat going another. He plunged into the cold dark water. Disoriented, he struggled for an instant to find the surface. Kicking hard, he broke the surface and started treading water. Remarkably, he still had on his topsiders. The boating shoes made it hard to swim. He knew they didn’t float, but they were expensive, so against reason, he kept them on. He stretched his leg down searching for the bottom. Nothing but cold water. Dog paddling, he swam to retrieve the paddle and then returned to the overturned canoe. Gone forever was his college coffee mug but the life vest floated next to the canoe, still tied to the seat. The kid at canoe rental said it was easy to get back into an overturned canoe. Remembering the kid’s instructions, he kicked hard and lifted the canoe out of the water, turning it over as he pushed up. The canoe righted its self, but took in considerable water as it did. He spent several minutes rocking the boat back and forth before he tried to climb in. At first, the canoe simply took in more water, and then it flipped over again. He was back where he started, except he was cold and exhausted. Clinging to the side of the canoe, he thought for the first time that he might die. In a moment of panic, he called for help, his cries sounding every bit as hopeless as the loon. He untied the life vest and put it on. He was fifty feet from the grasses and line of trees beyond. On shore, he thought, he could empty the boat of water and start out sitting in the front. Grabbing a rope Joe had tied to the bow, he tried pulling the boat and when that didn’t work, he pushed the canoe as he swam. Neither worked well and he was exhausting what little energy he had left. Relying on the vest, he floated beside the canoe. He was tired and cold. He needed to get out of the icy dark water. In a moment of clarity, he remembered the kid saying a canoe would float even when filled with water. Turning the boat over again, he threw the paddle in the canoe, and this time pulled himself in even as the canoe filled with water. After a brief struggle, he was sitting in middle of the flooded boat. Taking up the paddle, he stoked the canoe towards the shore. It’ll be alright, he thought. He paddled the boat past the lily pads and into the carpet of brown and red grass. Stroking hard, he tried to beach the boat on the grass. Instead, the grasses opened up and swallowed the little canoe. The grass was a dense floating carpet, unattached to solid ground. He pushed the boat deeper into the weave of weeds trying to reach the line of trees. Eventually canoe stuck on top of the thick carpet of vines. With his paddle, he pushed down through the red grass searching for the bottom. The paddle struck something solid less than three feet below. Holding onto the far side of the canoe, he put a leg over the side. He planned to walk the boat to shore. The next thing he knew he was in waist-deep water with his feet buried in a foot of muck. Lifting his right leg, his topsider got sucked into the mud. Bog. He was still in trouble. The blanket of water covering the moss and peat stretched out in all directions. Shivering with cold and exhaustion, he had a moment of panic, he knew he needed to get back in the boat, before he made a fatal mistake. Turning the canoe over, he let as much water drain out as possible, then grabbing the far gunwale, he hoisted himself in, all two hundred pounds. In the process, he lost the other topsider to the quagmire, but he was in the bow of the boat with the paddle in hand. Leaving the life vest on, he pushed the canoe off the grass, and stroked towards the narrow opening to the cove. He eventually made it out and into the larger lake. The wind had picked up and he had to contend with a light chop. From the front seat, he paddled for the next hour arriving at camp muddy and exhausted. Getting out of the canoe, he took a moment to savor the fact that he was alive. He used his bandana to wash the muck from his legs and body, the oily mire hard to remove. “Want some soap, or just out for a swim?” Joe called from his tent. “I went out in the canoe,” he answered. Behind him, the dark water was silent.